SEPTEMBER 17--A Florida man arrested for child abuse struck his underage female victim with a metal rod to the beat of “Blurred Lines,” the hit song by Robin Thicke, according to a police report. Investigators arrived Sunday night at the Pensacola home of Steven Grady Fillingim, 40, in response to a child abuse complaint. The victim told Escambia County Sheriff’s Office deputies that Fillingim beat her for being “lazy” and cutting school last Thursday. 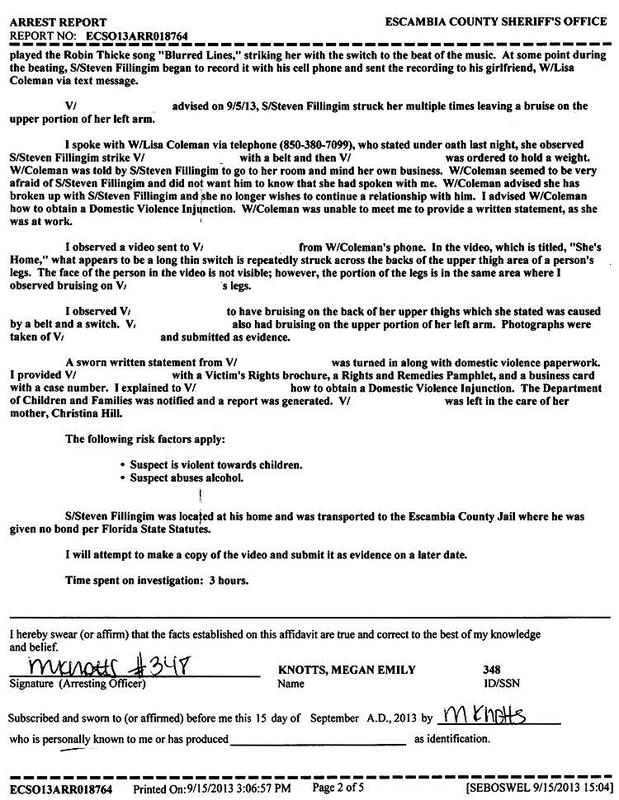 While the victim’s name has been redacted from a sheriff’s office report, she appears to be Fillingim’s daughter. The girl told investigators that Fillingim had struck her in the face with a belt and his hands. She also detailed other harsh punishments, including being forced to shovel dirt for 90 minutes before being allowed to go to bed at 1:30 AM. On the day she skipped school, the girl told deputies, Fillingim beat her on the legs with a 30-inch metal rod known as a “switch.” During the videotaped assault, which lasted 40 minutes, Fillingim “played the Robin Thicke song ‘Blurred Lines,’ striking her with the switch to the beat of the music,” according to an unsettling Escambia County Sheriff’s Office report. 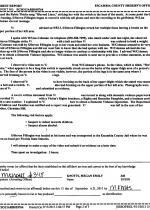 Investigators obtained the video shot by Fillingim, who shared the recording with his girlfriend Lisa Coleman via text. As described by deputies, the clip--titled “She’s Home”--shows someone being struck with a switch on the upper thigh. While the subject’s face is not seen in the video, a sheriff’s deputy noted that bruising on the teen victim’s legs were consistent with the kind of thigh strikes caught on tape. Coleman told investigators that she had seen Fillingim strike the girl and force her to hold a weight for extended periods of time. The woman added that she has broken up with Fillingim. 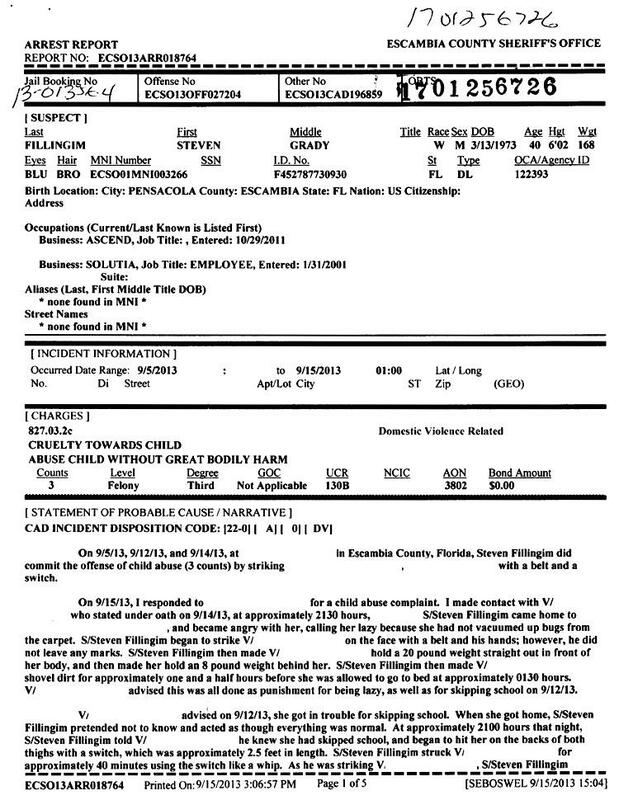 Seen in the above mug shot, Fillingim is jailed without bond on the felony child abuse charge. 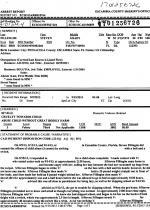 He is scheduled for a September 25 Circuit Court hearing.